When the United States became independent after the American Revolution, it had to struggle to protect its seaborne commerce in the Atlantic and Mediterranean. Americans had to rely on the goodwill of France, Portugal, and other European powers because the United States lacked the naval power necessary to protect its own shipping. Americans had to negotiate with the Barbary states to secure the release of hostages, taken by Barbary corsairs, and to decide how much tribute would guarantee the safety of American shipping. The United States quickly felt the bite of diplomatic and military impotence. American diplomats, who had little power of their own, had to rely on the good graces of many others with better connections to the Algerine court. Sometimes, those others helped the American cause; at other times, they weren’t all that helpful; and on a few occasions, they purposely derailed American negotiations. The story of American-Barbary diplomacy is all about relationships. Naturally, a story about relationships suggests a network graph as a way to make the situation more intelligible. 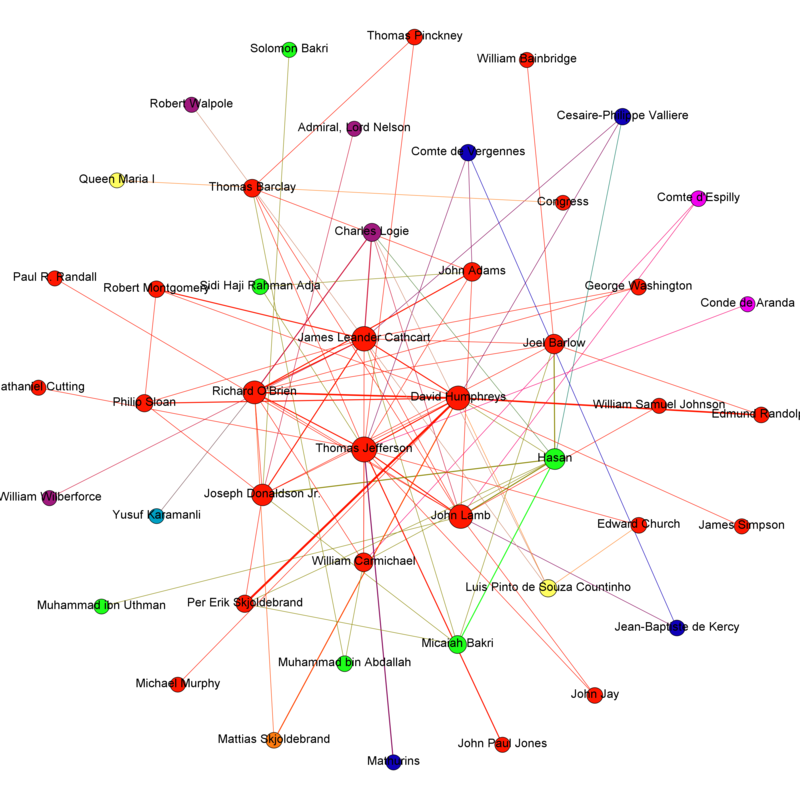 To represent the American-Barbary diplomatic network, I created the graph in Gephi. I hate Gephi. I like Gephi. (You know what I mean.) This graph represents interactions from approximately 1785 to 1800. The last interaction I recorded was between the dey of Algiers and William Bainbridge in September 1800; this interaction was the first one in which the navy was directly involved (though it was a diplomatic interaction, not a military one). I decided to end my graph there because I’m most interested in how the navy changed things for U.S. relations with the Barbary states and with the European nations who had hitherto helped those relations. The nodes are people who had a connection to Barbary diplomacy. The edges are letters and meetings that Parker writes about. I checked up on as many as I could using American State Papers, and I will continue to document the interactions more explicitly than Parker does in his bibliography (where he only records the collection, not the exact document, his source comes from). Each node is color-coded by nationality; the next step is also to record where these people were actually living while they were engaged in Barbary negotiations. The graph isn’t perfect (obviously). There’s a lot more to be done here. This graph is based solely on Parker’s book, which I’m not wholly convinced is accurate. In addition, Parker addresses only diplomatic relations with Algiers, not the other three Barbary states (Tripoli, Tunis, and Morocco). Furthermore, I haven’t attached dates to each edge, simply because Parker doesn’t provide dates for all of the interactions. A more dynamic timeline of the network changes would be most instructive. So there’s a lot more data that needs to be added to this graph. But I think it’s a good start toward understanding the global nature of American relations with the Barbary states, which culminated in the Barbary Wars of 1801-1805 and 1815.